A. M. Rosenthal joined the New York Times in 1943 and remained there for 56 years, to 1999. Rosenthal won a Pulitzer Prize in 1960 for international reporting. As an editor at the newspaper, Rosenthal oversaw the coverage of a number of major news stories including the Vietnam war, the Pentagon Papers, and the Watergate scandal. Together with Catherine A. Fitzpatrick, he was the first westerner to visit a Soviet GULAG camp in 1988. 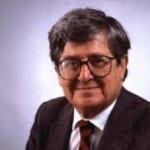 Rosenthal had a weekly column at the New York Daily News following his run as a columnist at the Times until 2004.